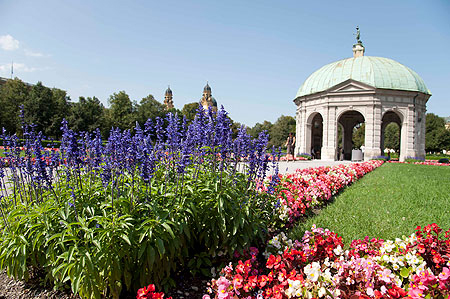 Creation of the Munich Court Garden began in 1613, at the same time as the new buildings and extensions erected by Duke Maximilian I. The garden lay outside the moat that then surrounded much of the Munich Residence. The original garden was elaborate, containing circular tempietti, avenues of mulberry trees, fountains, arcades, ornamental box hedges and fruit trees. The central pavilion, designed in 1615 by Heinrich Schön the Elder, survives, its eight arches reflecting the division of the garden by cross-shaped and diagonal paths. The pavilion is capped by a copy of Tellus Bavarica, a monumental bronze figure symbolising the treasures of the Bavarian land: grain, game, water and salt. The statue was created by Hubert Gerhard before 1590 and was moved to the court carden pavilion from one of the Residence gardens in 1616 by Duke Maximilian I. To protect it from the elements, the original sculpture is now a part of the bronze collection in the Vierschäftesaal of the Munich Residence. 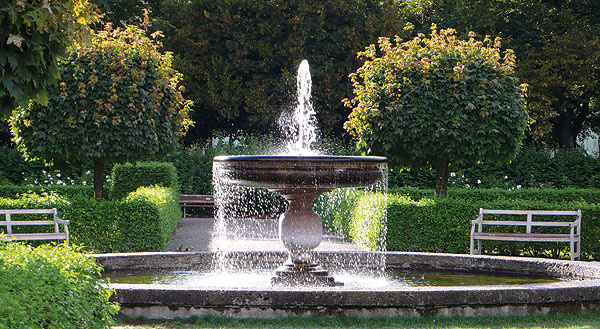 The fountain machinery in the court garden is in operation from April to October every day from 10 am-2 pm.